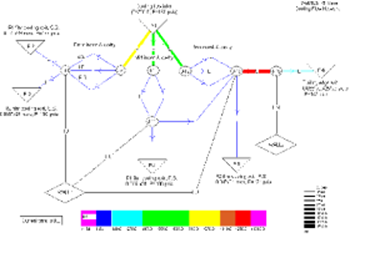 Advanced computer modeling methods are used to analyze problems with existing components and their operation. Proposed component design and material changes can then be evaluated before they are implemented. · Dimensional inspection and reverse engineering of the component defines the solid model geometry for detailed analysis. · Internal cooling flow measurements are used to calibrate the computer models. 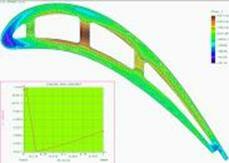 · Perform Aero-thermodynamic mean line analysis of the engine for both design point and off design conditions. · Define the component external and internal temperature and heat transfer boundary conditions. 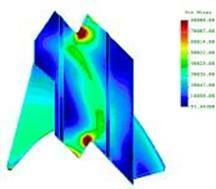 · Experienced engineers create finite element models for heat transfer, stress and vibration analysis. Suitable material properties, constraints, thermal and mechanical loads are applied to the model. · The analysis is run and verified to ensure accurate and complete results. The results are evaluated and compared to the design guidelines and allowable values. · A report is provided documenting the analysis and recommending component replacement intervals or suitable corrective action based on the results. · Software tools in use include CADKEY, COSMOS/M, CFDesign, SINDA/FLUINT, GasTurb, CPF, PCPANEL.